One of the most intriguing album releases of this year doesn’t sound like a new record, not at all. 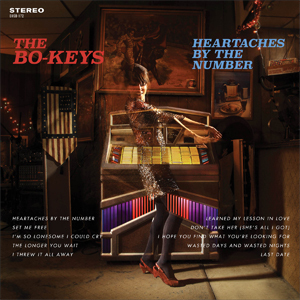 Recorded in Memphis, Tennessee and featuring veteran musicians from the city’s rich musical history, The Bo-Keys‘ Heartaches by the Number (Omnivore Recordings) builds upon classic songwriting and like-minded original tunes to create a timeless recording. But a success like this didn’t happen overnight. Bandleader and producer Scott Bomar admits that in 2016, he’s “not 100% sure what year it was” that the story of The Bo-Keys began – Wikipedia suggests 1998, for what that’s worth – but he remembers the pertinent details. “Some friends of mine here in Memphis own a record store, Shangri-La Records. They did a holiday party every year, and they asked me if I had any idea of a band to book for the party.” Bomar told them that he had recently seen Sir Mack Rice perform at an event put together by Deanie Parker of the legendary soul label Stax Records. That show had also included Booker T and the MGs, Rufus and Carla Thomas, Eddie Floyd, William Bell, “all the living Stax artists,” says Bomar. The Mack Rice show was a success. “The band’s lineup changed somewhat between then and the time we made our first record, The Royal Sessions ,” Bomar says. That record featured Mitchell and Charles “Skip” Pitts, “half of Isaac Hayes‘ old rhythm section,” Bomar notes. “Those two have a very special sound together, a very 1970s sound.” When drummer Howard “Bulldog” Grimes joined, Bomar says he brought a more 1960s sound to the band. “Howard was the first African American drummer at Stax; he played on a lot of the early Satellite [Records] r&b sides.” The Bo-Keys would go on to release three EPs, a singles collection, and two more full length albums. Their latest, the country-soul flavored Heartaches by the Number, was released in April 2016. Bomar’s plans didn’t originally include putting together his own studio. “But around 2004, I started doing a lot of work on films.” His credits would eventually include Black Snake Moan, Hustle & Flow and a number of others. “When I got busy with the film work, it became necessary for me to have my own place to record,” Bomar says. “It would be the middle of the night, and I’d have to turn something in to send off to Hollywood.” The first Electraphonic was in Bomar’s home; things grew quickly from there. Electraphonic would eventually move to a downtown Memphis location, the site of a former production studio for a motion picture laboratory. The space already had a sound room, so it was a natural fit. “In the downtime between my own projects, I would record other people,” Bomar says. “But I was having a hard time finding a label for some of the good records I was making.” So though it wasn’t part of Bomar’s grand design either, the Electraphonic record label developed naturally as an extension of the studio. The City Champs‘ first album (2009’s The Safecracker) was the first Electraphonic release. “Those guys came in and recorded that record, and I was just blown away by it,” says Bomar. “I think I’ve probably listened to that record more than anything I’ve ever worked on.” Two City Champs – organist Al Gamble and in-demand session guitarist Joe Restivo – would eventually become part of Bomar’s Bo-Keys. The approach to making Heartaches by the Number was similar to the way Bomar recorded previous albums at Electraphonic. The studio is equipped with a vintage 1” eight-track Scully machine. “It’s one of the first transistor-era tape machines, from 1967,” Bomar says with pride. “It has a really signature sound; now that I’ve had it for a long time, I can hear old records on the radio and know which ones were recorded on a Scully.” The aforementioned old-school approach meant that the entire process was free of things like computers. “We did some tape editing, but it was never put into ProTools or anything like that,” Bomar says.